MILWAUKEE, WI. – Suburban Motors Harley-Davidson’s Steve Rapp took a convincing win in the third round of the 2013 AMA Pro Vance & Hines Harley-Davidson series at Barber Motorsports Park, in Birmingham, Ala., to earn his second consecutive victory of the season. Despite missing the first practice session of the weekend, Rapp, a fulltime airline pilot who often flies to races on late notice, qualified on the front row next to series leader and polesitter Michael Barnes (Spyke’s H-D), the defending series champion, who led the first lap of the 11-lap contest and kept the pressure on Rapp after he claimed the lead on the second lap. Barnes and Rapp circulated nose-to-tail within a second of each other for the first half of the race, but by the seventh lap, Rapp had extended his gap over Barnes to just over one second and eventually built it into a 5.454-second victory margin. With his second place finish, Barnes maintained the series points lead by a slim one-point margin, but the most exciting action on the track was for the third step of the podium. 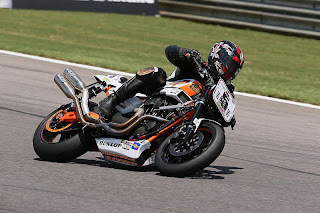 That battle was won by Tyler O’Hara (Eco Fuel Saver/Scrubblade) on the last lap, who nipped Suburban Motors H-D’s Benny Carlson by a 0.017-second margin to also take over third place in the points standings. Travis Wyman (Harv’s H-D) rode a lonely race to fifth position, followed by Shane Narbonne, Barrett Long, Nicholas Hansen, Ricky Parker and Adam Raffe, who rounded out the top ten finishers. 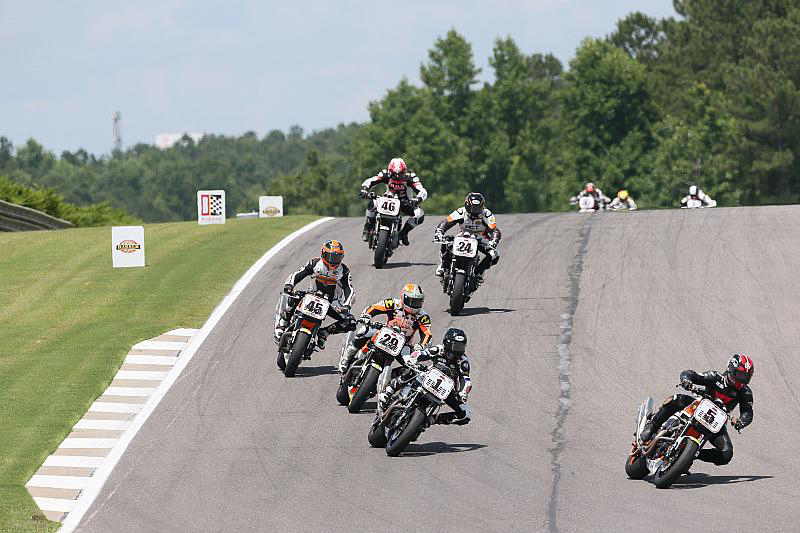 The AMA Pro Vance & Hines Harley-Davidson series returns to action July 13-14 at Mid-Ohio Sports Car Course in Lexington, Ohio.